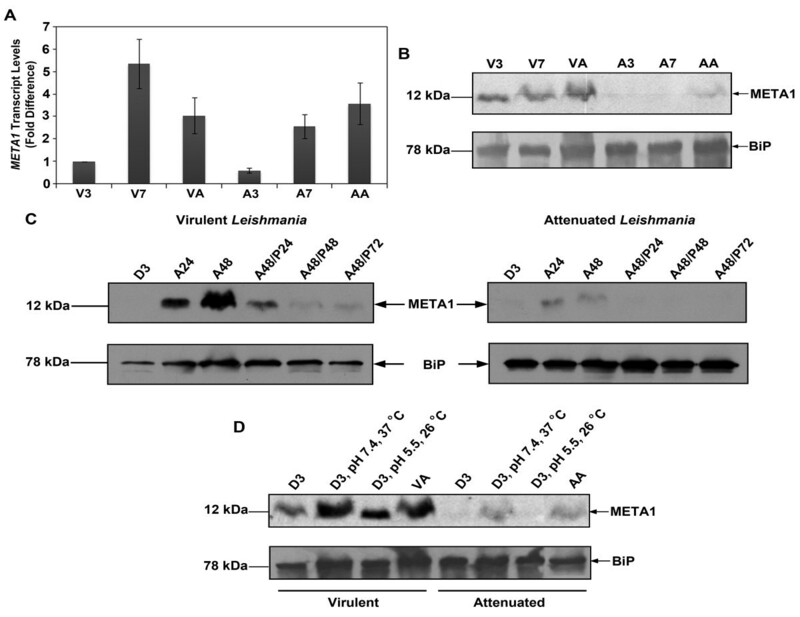 Leishmania META1 has for long been a candidate molecule for involvement in virulence: META1 transcript and protein are up-regulated in metacyclic Leishmania. Yet, how META1 contributes to virulence remains unclear. We sought insights into the possible functions of META1 by studying its evolutionary origins. Using multiple criteria including sequence similarity, nucleotide composition, phylogenetic analysis and selection pressure on gene sequence, we present evidence that META1 originated in trypanosomatids as a result of a lateral gene transfer of a bacterial heat-inducible protein, HslJ. Furthermore, within the Leishmania genome, META1 sequence is under negative selection pressure against change/substitution. Using homology modeling of Leishmania META1 based on solved NMR structure of HslJ, we show that META1 and HslJ share a similar structural fold. The best hit for other proteins with similar fold is MxiM, a protein involved in the type III secretion system in Shigella. The striking structural similarity shared by META1, HslJ and MxiM suggests a possibility of shared functions. Upon structural superposition with MxiM, we have observed a putative hydrophobic cavity in META1. Mutagenesis of select hydrophobic residues in this cavity affects the secretion of the secreted acid phosphatase (SAP), indicating META1's involvement in secretory processes in Leishmania. Overall, this work uses an evolutionary biology approach, 3D-modeling and site-directed mutagenesis to arrive at new insights into functions of Leishmania META1. Leishmaniasis is a spectrum of parasitic disease caused by Leishmania spp. protozoa, transmitted to its mammalian host by bite of an infected female sand fly vector. The clinical manifestations of the disease range from the potentially fatal visceral disease caused by L. donovani complex (L. donovani and L. infantum) to disfiguring, but self curing cutaneous form caused by L. major in the Old World and L. amazonensis and L. mexicana in the New World. Within the sand fly, Leishmania exists as an extracellular, flagellated form and gets transformed into an intracellular, sessile amastigote in phagolysosome of the macrophages. The role of many molecules like GP63 [1–5], lipophosphoglycan [6–12], cysteine proteases [13–15] etc. that are differentially expressed in the two developmental stages of the parasite have been studied for their involvement in adaptation of the parasite in such disparate environments and enhancing virulence of the parasite. A lot more remains to be learnt, including the functions, of many such virulence factors. Understanding the mechanistic details of function of virulence factors will help us develop novel intervention strategies against the parasite and the disease. META1 was one such gene identified in L. major, found to be conserved across the Leishmania genus. Both transcript and protein was found to be up-regulated in the metacyclic stage of promastigotes. The META1 protein was found to localize surrounding the flagellar pocket in L. major stationary phase promastigotes . On META1 overexpression in L. amazonensis, parasites were found to be more virulent than wild-type . Another gene in Leishmania, also up-regulated in metacyclic promastigotes is named META2, and contains three META domains and a calpain-like domain at the carboxy terminus . META (PF03724) is currently described as a small domain family of unknown function in Leishmania META1 and in bacterial proteins, hypothetically secreted/implicated in motility. However, apart from some of its developmental expression and its suggested role in virulence, the precise functions of META1 in the parasite remain unknown. In order to understand META1's function, we investigated its relationship with its near homologs in other organisms. Based on several criteria, we have been able to establish in this study that META1 of Leishmania is a homolog of a bacterial gene for a heat shock inducible protein, hslJ that has been transferred by an ancient lateral gene transfer event between bacteria and a trypanosomatid ancestor. We have highlighted similarities in various characteristics of the two proteins like their relatedness to pathogenicity/virulence, heat inducible expression and also shown by homology modeling that they are not only evolutionarily linked but structurally similar as well. Furthermore, our homology modeling identified yet another structural homolog MxiM, a secretin pilot protein of Shigella flexneri, which is involved in that pathogen's type III secretion system. Based on structural homology between META1 & MxiM and subsequent mutagenesis, we have identified a putative hydrophobic cavity in Leishmania META1 that seems to be important for function of META1 and indicates a role for META1 in Leishmania secretory processes. The META1 sequence is highly conserved across the Leishmania genus . Based on this high degree of conservation and the convenient accessibility of L. major genome sequence and other related resources over those for other Leishmania species, all of our bioinformatics analyses have used L. major META1 as the representative species. We began our study by using BLASTP to search for homologs of META1 protein against the NCBI NRDB. Homologs of META1 were found in all other Leishmania species and Trypanosomes (Additional file 1). Since BLASTP search failed to detect any functionally characterized homolog within or outside the Trypanosomatidae family, a PSI-BLAST search was performed against NCBI NRDB. This search yielded hits beyond the trypanosomatids as early as the second iteration. Interestingly, these significant hits were all homologs of the heat shock inducible protein HslJ from bacteria. Table 1 lists representative hits after 3 iterations. All sequence homologs of META1 (trypanosomatid as well as bacterial) are characterized by the presence of at least one META domain. Although there is a low direct pairwise sequence identity of 25% between META1 and HslJ (Figure 1), bacterial HslJ is currently the closest relative of Leishmania META1 outside the family Trypanosomatidae. The most likely explanation for this unusual phyletic relationship is that META1 in trypanosomatids originated as a result of a lateral gene transfer (LGT) event from bacteria. Sequence similarity between Leishmania META1 (1-112 aa) and E. coli HslJ (25-140 aa). Amino acid sequence of L. major META1 (LmjMETA1) is globally aligned to E. coli HslJ devoid of the N-terminal signal sequence using EMBOSS. Residues shaded in black are identical and residues shaded in grey are conservative substitutions. The numbers on the right indicate amino acid positions. Most genomes have distinct overall GC content and the genes in their genome are fairly similar in base composition and patterns of codon usage. A laterally transferred gene continues to carry imprints of its origin and ancestry whilst residing in its current recipient genome. Such 'foreign genes' can be identified by their unusual sequence characteristics vis a vis the recipient genome [19–21]. GC content at first and third codon positions and synonymous codon usage are generally used for such analysis. ORFs are identified as atypical if their GC contents at first and third codon positions (GC1 & GC3 respectively) are two or more standard deviations (SDs) higher or lower than the respective means for all genes in that genome. Our analysis revealed that the total GC content of L. major META1 is 54%, which is 6.3 SD lower than the average of the total GC content of all genes in L. major genome. In addition, LmjMETA1 has a GC1 content of 48.67% (15.8 SD lower than GC1 of all genes in L. major genome) and a GC3 content of 77% (within the range of SD for GC3 of L. major genome), as summarized in Figure 2A. GC content anomaly results establish that META1 nucleotide composition is distinct from the overall Leishmania genome and therefore, is possibly of foreign origin. Atypical nucleotide composition. (A) GC content anomaly. GC content anomaly. Percentage of total GC content and GC content at codon positions of all L. major ORFs and L. major META1. The vertical error bars represent the mean value +/- 2 S.D. for L. major genome. Total, total GC content; GC1, GC content at first codon position; GC2, GC content at second codon position and GC3, GC content at third codon position. (B) Codon usage bias. Codon Adaptation Index (CAI) of 7 reference genes (Amastin, GP63, Hexokinase, Ribosomal Protein (RP) S8, α-Tubulin, PTR-1, Coproporphyrinogen (Coprogen)) and META1. The accession numbers of the protein sequences used are given in Additional file 2. Codon adaptation index (CAI), on the other hand, gives an account of similarity of synonymous codon usage to that of a standard set of highly expressed genes for that organism. Thus, for a native gene CAI is high and for a gene of exogenous origin CAI value is low. As part of CAI determination, we analyzed a set of other genes for reference along with META1 (Additional file 2). The genes that were included: Amastin & GP63 (specific to trypanosomatids), Hexokinase & Ribosomal Protein S8 (present in all taxa), α-Tubulin (a pan-eukaryotic structural protein) and PTR-1 & Coproporphyrinogen, previously predicted to be laterally transferred in L. major from bacteria . META1, PTR-1 and Coproporphyrinogen all have low CAI values when compared to the other reference genes (Figure 2B), suggesting again, that META1 is of exogenous origin. We also carried out a similar analysis on META1 homologs in T. cruzi (Additional file 3); where once again the CAI of the META homologs is lower than that of other Trypanosoma genes (RP S8 and α-Tubulin). These analyses, and the striking frequency of bacterial HslJ hits, point to bacterial hslJ being the exogenous source of META1 into trypanosomatids. In order to study the phylogenetic linkage between META1 and HslJ, we generated a phylogenetic tree based on the protein sequences of META1 homologs in trypanosomatids and HslJ homologs in bacteria. A multiple sequence alignment containing 30 sequences (16 trypanosomatid and 14 bacterial) was used to create a phylogenetic tree using PhyML. Topology of the phylogenetic tree and the bootstrap values of the branch points (Figure 3), again indicate the occurrence of a LGT event of META/hslJ from bacteria to a trypanosomatid. Phylogenetic relationship between META1 and HslJ. Phylogenetic analysis was done using PhyML . The phylogram represented is a consensus of a 100 bootstrap replicates and is rooted at the basal node. The numbers at the node represent the percentage of trees with the same node among all of the bootstraps. Only bootstrap values ≥ 40% have been mentioned. A horizontal bar marked with 0.1 above the tree represents scale of the generated tree. Estimation of synonymous (Ks) and non-synonymous substitution (Ka) rates is an important tool for understanding molecular sequence evolution and the ratio of non-synonymous to synonymous rate of substitution (Ka/Ks) reflects the selection pressure on a gene . We observed that META1 and the META domain in bacterial hslJ homologs are under strong purifying selection as indicated by the Ka/Ks values < 1 in a pairwise comparison of LmjMETA1 and META domain of 14 bacterial hslJ homologs (Figure 4). Therefore, lower substitution rates for META1 emphasizes the selection pressure on it, a constraint on the Leishmania genome not to change it rapidly and thus, the importance of conservation of this gene. 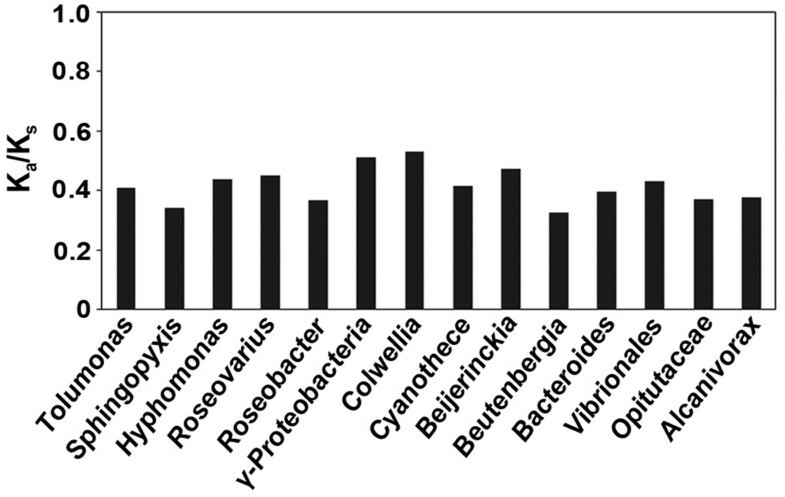 Synonymous (K s ) and non-synonymous (K a ) substitution rates of Lmj META1 and META domain of all bacterial HslJs. Substitution rates were estimated using Yang and Nielson method  as implemented in yn00 in the PAML package. All bacterial HslJ homologs from PSI-BLAST with a representative sequence from each genus were used, with an e-value threshold ≤ 1x10-5. hslJ transcript is up-regulated in more pathogenic strains of E. coli  and the protein is heat inducible . To delineate similarities between META1 and hslJ, we investigated the expression pattern of META1. META1 transcript levels were determined by QRT-PCR at different developmental stages of virulent and attenuated lines of L. donovani. META1 transcript is up-regulated from log to stationary phase promastigotes as well as from promastigote to amastigote stage (Figure 5A). META1 protein in L. donovani is maximally expressed in amastigotes (Figure 5B) even though META1 transcript levels in amastigotes are lower than stationary phase promastigotes. META1 protein is induced within 24 hours of shift to amastigote culture conditions, increases further upto 48 hours and its expression decreases within 24 hours of reversal back to promastigote conditions (Figure 5C). The most striking observation is that attenuated Leishmania have reduced META1 expression under all conditions, as compared to virulent cells (Figure 5). META1 expression in Leishmania donovani. (A) Quantitative RT-PCR analysis of META1 transcript in virulent and attenuated lines. The relative expression of META1 gene in various stages is presented as fold difference over expression in V3. The average of 3 biological replicates is presented. Bar represents standard deviation. V3 and A3: virulent and attenuated log phase promastigotes respectively; V7 and A7: virulent and attenuated stationary phase promastigotes respectively; VA and AA: virulent and attenuated amastigotes respectively. (B) META1 protein expression in virulent and attenuated lines. Total cell lysates from various stages of L. donovani were obtained at the indicated growth stages. The samples were assessed by western blotting with META1 (upper panel) and BiP (lower panel) antibodies. Leishmania BiP is a chaperone protein in the endoplasmic reticulum and was used as a loading control. (C) Time-course kinetics of META1 expression in promastigotes and amastigotes. Total cell lysates at various time intervals after switch to amastigote culture conditions from promastigotes of L. donovani were obtained at the indicated time points. Lysates were probed with META1 (upper panel) and BiP (lower panel) antibodies. Left panel represents virulent and right panel represents attenuated L. donovani respectively. D3: log phase promastigotes; A24 and A48: 24 hours and 48 hours after shift to amastigote culture conditions respectively; A48/P24, A48/P48 and A48/P72: 48 hours amastigotes shifted to promastigote conditions for 24 hours, 48 hours and 72 hours respectively. (D) Heat inducible expression of META1. Total cell lysates after individual or concomitant shift to pH 5.5 or 37°C for 48 hours of L. donovani promastigotes at pH 7.4 and 26°C were obtained for both virulent (lanes 1-4) and attenuated (lanes 5-8) L. donovani. Lysates were probed with META1 (upper panel) and BiP (lower panel) antibodies. D3, pH7.4, 26°C: log phase promastigotes; D3, pH7.4, 37°C and D3, pH5.5, 26°C: log phase promastigotes at pH 7.4 shifted to either 37°C or pH 5.5 at 26°C for 48 hours respectively; VA and AA: virulent and attenuated amastigotes respectively. Acidic pH and increased temperature (shift from 26°C to 37°C) are very important cues for the in vivo as well as in vitro conversion of promastigotes to amastigotes [26–28]. Since we found that META1 is up-regulated in amastigotes stage, we investigated the role of these two parameters individually. We found that while both acidic pH and increased temperature induce META1 expression, increased temperature has a greater effect (Figure 5D). Levels of META1 on western blots have been quantified as shown in Additional file 4. In the absence of a solved structure of Leishmania META1 protein, we used 3D-JURY  structure prediction to look for structural homologs of META1. Consistent with our earlier searches, we found the top scoring model for META1 was based on E. coli HslJ. HslJ structure has 10 β-strands, which resembles a β-barrel structure except of the discontinuity caused due to the presence of the α-helix. We also generated a structural model by homology modeling using MODELLER 9v2  for Leishmania META1 using E. coli HslJ (PDB code 2kts) as the template. The final model (Figure 6A) comprises of complete META1 sequence (1-112) threaded on known NMR structure of E. coli HslJ (PDB code 2kts) for residues 25-140 (Figure 6B). The two proteins share a similar structural fold given that 107 Cα atoms of total 116 Cα atoms across the length of the proteins could be superposed with a root mean square deviation (RMSD) value of 1.2 Å and a sequence identity of ~ 28%. The striking structural similarity underscores that despite low sequence identity, META1 and HslJ have been under evolutionary constraints to retain a similar fold. Structural similarities between META1, HslJ and MxiM. (A) Superposition of META1 (green), HslJ (magenta; PDB code 2kts) and MxiM (yellow; PDB code1y9t) in stereoscopic view. The arrowheads mark the N-terminus and the C-terminus of the proteins. The figure was prepared using the software PyMol . (B) META1 and HslJ sequence alignment based on MxiM structural superposition. Regions marked by horizontal grey bars below the alignment indicate helices and its corresponding amino acids are also shaded in grey. Beta strands are marked by black bold arrows below the alignment and the corresponding amino acid residues are shaded in black. Conserved residues are marked by (*) above the alignment. Amino acid residues lining the core of the hydrophobic cavity deduced based on structural superposition of META1 and HslJ with already described pocket of MxiM, are marked by (#). The alignment was generated by PROMALS3D . (C) Molecular surface representation of MxiM (1y9t, left panel) and Leishmania META1 (right panel) highlighting their respective hydrophobic cavities. This representation was generated by superposing Leishmania META1 (right panel) onto MxiM (left panel, 1y9t) with its ligand in the proposed hydrophobic cavity. The surface is colored according to atom type: carbon atoms in grey, sulphur atoms in yellow, nitrogen atoms in blue and oxygen atoms in red. A zoom in view of the putative hydrophobic cavity of Leishmania META1 is represented as inset. Hydrophobic cavities of the both proteins have been indicated by an arrow. First 4 amino acids from the N-terminus from Leishmania META1 have been removed for clarity. The figure was prepared using the software PyMol . Since little is known about E.coli HslJ's function with respect to its structure, we decided to look for additional proteins with similar fold. In DALI server , we found a structural homolog of HslJ: the Shigella flexneri protein MxiM (Figure 6A and Additional file 5). Despite a low sequence identity between HslJ and MxiM of only ~13%, 94 Cα atoms of the total 116 Cα atoms could be superposed with an RMSD value of 2.5 Å, as determined by DALI pairwise comparison . Similarly, META1 and MxiM share a sequence identity of ~9%; yet, 94 Cα atoms out of the total 115 Cα atoms could be superposed with an RMSD of 2.6 Å. MxiM is a type III secretion apparatus (TTSS) pilot protein, which is a 142-residue lipoprotein, essential for the assembly and membrane association of the Shigella secretin, MxiD . A deficiency in MxiM leads to complete loss of TTSS function and virulence . The structure of MxiM contains a 'cracked barrel' motif that creates a striking cleft in the centre of the protein. The cavity is entirely hydrophobic in nature and binds to lipid moieties of outer membrane (OM) of the bacteria . Likewise, we observed that META1 and HslJ also have a similar hydrophobic cavity upon their superposition to MxiM (Figure 6C). However, unlike in MxiM, the putative hydrophobic cavity in META1 has at least one charged residue in its core (Figure 6B). Overall, structural comparisons between META1, HslJ and MxiM further reinforce their fold similarity. This pattern of structural and not sequence conservation signifies selection pressure on the structure of these proteins, probably for maintaining similar functions. In L. major, META1 is reported to localize around the flagellar pocket , the site for exo- and endocytosis in Leishmania . MxiM, in addition to its known participation in Shigella TTSS, is also known to be structurally similar to the bacterial lipocalin . Lipocalins are known extracellular transporters that bind small hydrophobic molecules . Against this background of information, the striking structural similarity between META1 and MxiM prompted us to examine whether Leishmania META1 had a role in Leishmania secretory processes. Secreted acid phosphatase (SAP) is the most abundant secreted glycoprotein of L. donovani [38–40] and estimation of extracellular SAP activity is routinely used as an indicator of the status of secretory processes in the parasite [41–43]. Therefore, SAP activity was assayed in culture supernatants in the context of different levels of META1. 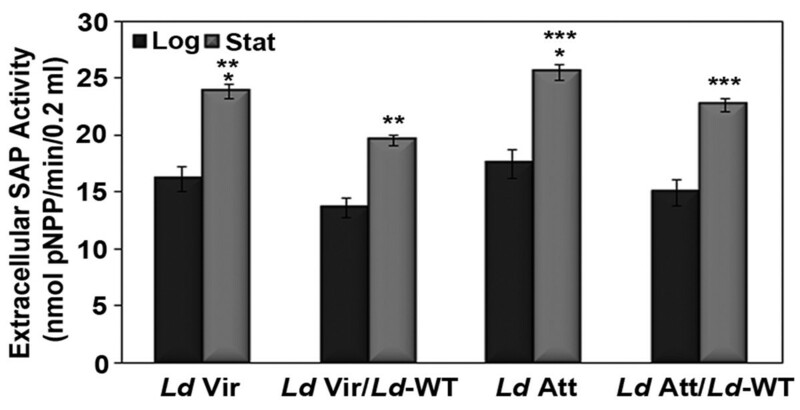 Extracellular SAP activity was found to be lower at both log and stationary phase in L. donovani virulent promastigotes that have more META1 protein, when compared to attenuated promastigotes (Figure 7). In order to determine whether extracellular SAP activity is directly related with levels of META1 expression, we ectopically expressed META1 in both virulent and attenuated L. donovani promastigotes. The ectopic copy of L. donovani META1 protein was tagged with GFP at the C-terminus to distinguish from the endogenous protein. On META1 overexpression, extracellular SAP activity further reduced in both virulent and attenuated overexpression lines in comparison to their respective wild-types (Figure 7). Overexpression of META1 at protein level and its effect on growth kinetics is shown in Additional file 6. This suggests that cells having higher amounts of META1 protein have lower extracellular SAP activity, indicating a role for META1 in secretory processes in Leishmania. META1 is involved in secretion in Leishmania. Extracellular SAP activity at log (black bars) and stationary phase (grey bars) of wild-type (Ld Vir & Ld Att) and META1 overexpressing (Ld Vir/Ld-WT &Ld Att/Ld-WT) L. donovani virulent & attenuated promastigotes lines respectively. SAP activity is represented in nmoles of pNPP hydrolyzed per min per 0.2 ml. The average of at least 5 biological replicates is presented. Bar represents the standard deviation. Means of the respective values at stationary phase were compared for statistical significance using a paired Student's t-test. *P < 0.005, **P ≤ 0.0002 and ***P ≤ 0.005. To examine whether the predicted hydrophobic cavity has any role in META1's function, we decided to mutate smaller hydrophobic residues in the cavity to bulkier ones, wherein we replaced leucines at 58th and 80th position with a phenylalanine individually and both simultaneously (L58F or/and L80F). L58 is located at the entry of the cavity and is conserved across trypanosomatids and bacterial HslJ. On the other hand, L80 is inside the hydrophobic cavity and is conserved in trypanosomatids, with the exception of L. braziliensis and T. cruzi as shown in Additional file 7. Mutant proteins were C-terminally tagged with GFP, in order to distinguish from endogenous protein and were ectopically expressed in L. donovani promastigotes. Extracellular SAP activity increased by 40% in L. donovani overexpressing L58F mutant META1 protein, as compared to cells overexpressing the wild-type (WT) META1 (Figure 8A). However, L80F mutation in META1 decreased the extracellular SAP activity with respect to WT overexpression. Moreover, extracellular SAP activity of the double mutant L58,80F was found to be similar to that of L80F mutant in L. donovani (Figure 8A). We also determined the intracellular SAP activity in all of these Leishmania lines. Consistent with the changes in extracellular activity, the percentage of intracellular v/s total SAP activity is higher in cells overexpressing WT, L80F and L58,80F META1, but lower in the L58F mutant, as compared to GFP control (Figure 8B). These results suggest that the 58th and 80th position are critical for the function of META1 in L. donovani. Similar results were obtained when L58F and L80F mutations were introduced into L. major META1, either individually or simultaneously (Additional file 8), reiterating that the L. donovani and L. major META1 proteins have a conserved function. We also observed a growth defect only in the double mutant in both L. donovani and L. major, which have higher multiplication rate at late logarithmic phase and start declining sooner than WT overexpression cells (Figure 8C and Additional file 8 respectively). The difference in SAP activity between cells overexpressing WT versus META1 mutant forms was not due to different amounts of META1 protein being expressed, as shown by western blots (Additional files 6 and 8). In order to eliminate the possibility of misreporting extracellular SAP activity due to cell lysis, a western blot on culture supernatants was done with GP63 and BiP antibodies, along with whole cell lysates as control. The culture supernatants that we used for the experiment did have extracellular GP63 but lacked ER chaperone BiP, as shown in Additional file 9. Overall, alteration in extracellular SAP activity in cells expressing META1 mutants points to a role for META1 in Leishmania secretory processes and highlights the importance of the putative hydrophobic pocket to META1's function. Mutagenesis in putative hydrophobic cavity of META1 alters secretion in Leishmania. (A) Mutations in putative hydrophobic cavity of META1 alter extracellular SAP activity. Extracellular SAP activity in L. donovani at stationary phase of vector control (Ld GFP), wild-type META1 overexpression line (Ld/Ld-WT), mutant META1 overexpression lines: L58F (Ld/Ld-L58F); L80F (Ld/Ld-L80F) and L58,50F (Ld/Ld-L58,80F) respectively. SAP activity is represented as nmol/min/107 cells. Means of the respective values were compared for statistical significance using a paired Student's t-test. *P < 0.0001 and ** P < 0.0003. (B) Fraction of intracellular v/s total SAP activity. Results are expressed as percentage of intracellular SAP activity of total SAP activity (intracellular and extracellular) measured in nmol/min/107 cells in all the transfectants at stationary phase. Means of the respective values were compared for statistical significance using a paired Student's t-test. *P < 0.004 and ** P < 0.0001. (C) Growth kinetics of L. donovani on META1 overexpression. Growth curves of L. donovani overexpressing either the wild-type META1, Ld/Ld-WT or mutant META1 L58F, L80F and L58,80F were compared to that of Leishmania with control vector, Ld GFP. Cell density (x 106 cells/ml) of each culture was determined at 24 hour time intervals after 48 hours of initial inoculation for up to 7 days. The cell densities plotted are average of at least 3 biological replicates. Despite Leishmania META1's well known association with virulence, its functions have remained poorly understood. We have attempted to elucidate the functions of META1 by identifying and examining its known homologs in other organisms. We have observed an unusual phyletic relationship between bacterial HslJ and trypanosomatid META1 which highlights LGT as the most rational explanation for the origin of META1 sequences in trypanosomatids. Analyses of several pathogen genomes suggest a widespread occurrence of LGT [20, 22, 44–49]. These studies have relied on combinations of aberrant nucleotide composition or sequence similarity searches and phylogenetic analyses. In our study we have included all of these approaches: sequence similarity, overall GC content bias, GC content bias at 1st and 3rd codon positions and codon usage bias of META1 over whole genome of L. major and phylogenetic distribution pattern. All of the individual analyses are consistent with the notion of META1 being laterally transferred from bacteria into trypanosomatids (Figures 2 and 3). In the analyses of such LGT events it is crucial to factor in multiple lines of evidence . By itself, the phylogenetic tree may be open to additional interpretations such as a "reverse" LGT flow from trypanosomatids into bacteria or a retention of META1 in trypanosomatids, from a common ancestor (with bacteria) with a loss from other species. However, the consistent topology of the phylogenetic tree, rooted in multiple manners (Figure 3 and Additional file 10) taken together with the striking anomalous nucleotide composition of META1 in Leishmania make it unlikely that the LGT flow of META1 was from trypanosomatids into bacteria. Or, that META1 was retained within Leishmania from a common ancestor: if META was persisting from an ancient common ancestor, its GC composition would have been assimilated into the trypanosomatid genomes. However, we cannot exclude a possibility that META1 was present in an ancient common ancestor, was lost during the evolutionary emergence of eukaryotes and at some point, regained by trypanosomatids through a LGT from bacteria. Clearly, more definitive answers to such events will emerge as the genome sequence information coverage of various taxa expands. Analyses of anomalous nucleotide composition is quite effective in the detection of recent LGT events but becomes handicapped as the time scale of the event in question increases typically because the gene in question has more time to adjust to the host genome . Given the diversity of bacterial species that have the META domain and the limited occurrence of META only in trypanosomatid eukaryotes, it is most likely that the transfer of META1 into trypanosomatids was an ancient event. In this regard, it is striking that the anomalous nucleotide composition of Leishmania META1 continues to be easily discernible. Maintenance of the foreignness of a laterally transferred gene in the context of its recipient genome could reflect either a recent transfer event or a selective pressure to maintain certain features. Given the occurrence and conservation of META1 sequence throughout trypansomatids, it is most likely the transfer of META1 from bacteria was an early event into a trypanosomatid ancestor. An organism always maintains certain evolutionary constraints on its essential genes, in order to prevent loss of function caused due to mutations. Thus, a gene under purifying selection will evolve at a slower rate than a gene under positive selection. Upon comparison of META1 with its bacterial homologs, we found that META1 is under strong purifying selection, therefore, highlighting the importance of function of this gene for the organism (Figure 4). Selection constraints on the META1/HslJ pair also underline the possibility of having similar properties. Our results have highlighted some of the properties shared by HslJ and META1. hslJ transcript up-regulation was found to be associated with pathogenicity in E. coli  and recovery of heat injured Salmonella enteritidis . In comparison, we observed that META1 expression too is regulated in developmental stages in L. donovani, consistent with earlier reports . We have also shown that attenuated Leishmania have lower META1 expression than virulent cells, consistent with a role for META1 in Leishmania virulence. In Leishmania, META1 expression is inducible by both temperature and acidification, with the temperature-mediated change being more significant (Figure 5). This observation underscores the heat-inducible property of META1, like its bacterial homolog HslJ . HslJ has been associated with increased resistance against a gyrase inhibitor novobiocin . We examined in Leishmania if META1 expression is associated with novobiocin resistance in virulent & attenuated lines of Leishmania as well as in META1 overexpressing lines. In the above mentioned conditions, we found no such correlation (data not shown). Clearly, not all functions are common between META1 and HslJ. Recently, L. amazonensis META2 that has 3 META domains and a C-terminal calpain-like domain was reported to be implicated in novobiocin resistance . This raises the possibility that our observations may be explained by META2 complementing for novobiocin resistance independent of META1 expression levels. 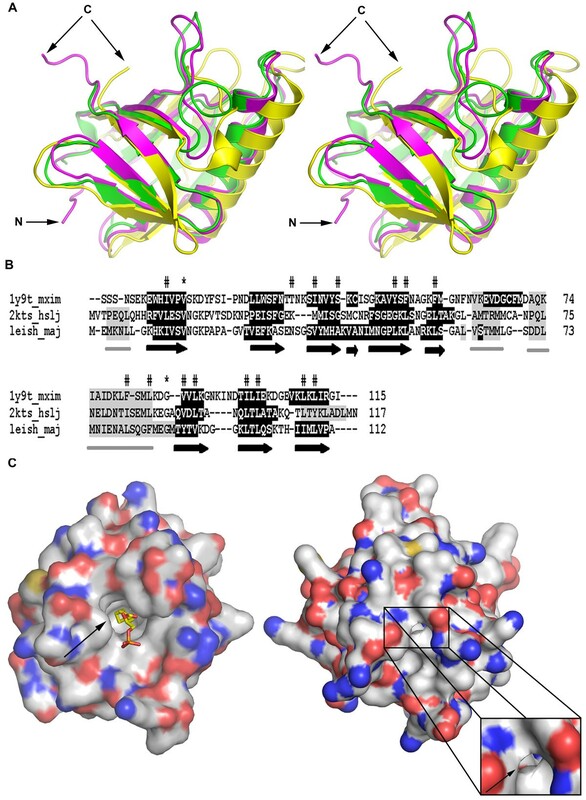 The 3D-modeling studies of META1 allowed us to identify an additional structural homolog of META1, the secretin pilot protein of Shigella flexneri, MxiM (Figure 6A). These three proteins: META1, HslJ and MxiM share a strikingly similar fold, in spite of a very low sequence identity. The essential features about the structural similarity of these proteins highlighted upon superposition are: a common cracked barrel motif and a set of conserved hydrophobic residues in the central pocket of the protein (Figure 6B). Such a structural homology between META1, HslJ and MxiM suggests a possibility of similar function of these proteins. Many proteins with similar function have been known to retain similar structural folds despite very low sequence identity and ambiguous secondary structure prediction [54, 55]. The hydrophobic cavity in MxiM is known to bind lipid moieties of bacterial membranes. However, unlike MxiM, the putative cavity of META1 has at least one charged amino acid suggesting that the ligand of this putative pocket may be different from MxiM (Figure 6B). It is possible that these proteins participate in similar activities, with certain residues in the cavity defining specificity of the ligand. Changes in levels and predicted structure of META1 affect the quantum of extracellular activity of the well characterized marker for Leishmania secretory processes, SAP (Figures 7 and 8). A comparison of proportion of intracellular v/s total SAP activity shows that overexpression of either WT or mutant META1 changes the extracellular SAP secretion (Figure 8B). 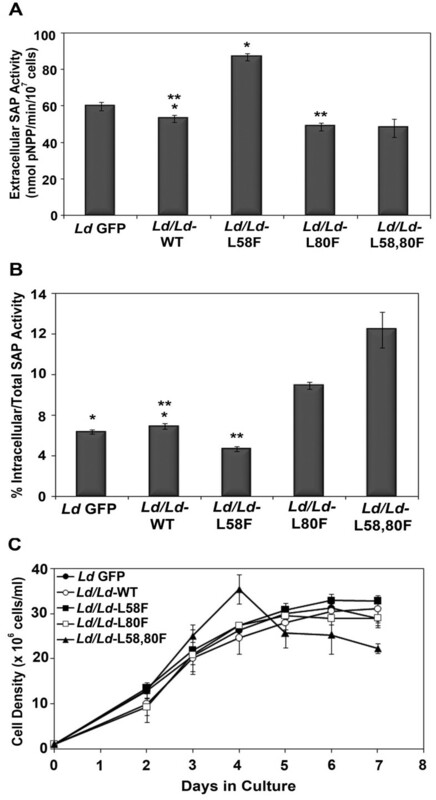 However, while ectopic expression of L80F mutant and WT reduces extracellular SAP activity, the L58F mutant META1 caused an increase in extracellular SAP activity. The L58F mutation appears to act as a loss of function event: there is more META1 protein but with a reduced negative effect on SAP activity. The proximity of this 58th position to the entrance of the putative hydrophobic cavity (Additional file 7) suggests impairment in interactions with the probable ligand of the putative cavity that may interfere with META1's function, in turn interfering with META1's ability to suppress SAP secretion. Additionally, in L. donovani, L58 epitopic region seems to be highly antigenic: when lysates of cells overexpressing the different forms of META1 were probed with polyclonal META1 antisera on a western blot, the L58F reactivity was extremely low compared to WT overexpression control. However, when the same proteins, all of which have GFP tagged to their C-termini, were probed with polyclonal GFP antibody, cell lysates exhibited equivalent amounts of GFP-tagged proteins (Additional file 6). The L80F mutation dominates over L58F mutation in case of the double mutant (L58,80F), as seen by its overall effect on SAP activity (Figures 8A and 8B). Contrary to the L58 position, L80 lies in the core of the cavity: this change in position may also explain the altered consequences of the two mutations. Overall, our results on META1 mutagenesis in its putative hydrophobic cavity are consistent with a role for META1 in secretory processes in Leishmania and that this cavity is important for META1's function. However, the double mutant has an altered growth (Figure 8C), suggesting that META1 may also be participating in events other than secretion. Overall, the consequences of META1 mutations on extracellular SAP activity are consistent in both L. donovani and L. major: L58F overexpression leads to increased SAP activity; L80F has an equivalent effect on SAP activity to WT META1 and L80F dominates over L58F in the double mutants (Additional file 8). Additionally, the L58F,80F double mutant has growth effects in both species (Figure 8C and Additional file 8). However, we did observe some differences between the two Leishmania species. One, the extent of effect on SAP activity is greater in L. donovani. Second, L80F has distinct effects in L. major. In L. major, L80F and L58,80F mutant META1 protein expression was not seen while L58F mutant protein is equivalent in expression as the overexpressed WT (Additional file 8). In spite of the presence of META1-GFP fusion transcripts in both L80F and L58,80F (Additional file 8), there is barely any detectable amount of mutant protein suggesting that the mutant protein is possibly getting degraded. These observations reiterate the fact that L80F mutation is dominant in L58,80F mutation. Since L80 lies in the core of the cavity which might be important for ligand binding (Additional file 7), it is possible that mutation at this site has disrupted ligand binding resulting in an unstable META1 conformation, leading to its degradation. It is increasingly clear that LGT is an important mechanism in the evolution of eukaryotes [50, 56]. An interesting finding has been the observed transfer of gene sets for metabolic pathways [22, 57]. This is particularly of importance in the case of unicellular eukaryotes: LGT from bacteria allows the acquisition of new abilities such as exploitation of ecological niches, infective abilities and metabolic capabilities. A practical advantage of such knowledge is that such LGT acquired genes are more likely to be conducive targets for drug development since the host eukaryote typically lacks these genes [50, 57]. Furthermore, over time, LGT event has played a significant role in the subsequent evolution of the META1 gene family in trypanosomatids, as can be seen from the occurrence of a number of paralogs in Trypanosomes and a separate gene in Leishmania, META2, which has three META domains. It is conceivable that, for Leishmania, at least one of the advantages of the LGT mediated acquisition of META1 was additional modulation of secretory processes. Secretion can be an important process for a pathogen seeking to modulate its host's responses via the export of effector molecules/virulence factors. Leishmania secrete various bioactive molecules that are involved in pathogenesis . Recently, a novel exosome-based pathway was identified as a general mechanism of protein secretion by Leishmania that is involved in pathogen-to-host communication and export of exosomal cargo into host macrophages . Furthermore, the exosomal cargo influences myeloid cells and is immunosuppressive . Our data is consistent with the correlation of META1 levels associated with Leishmania virulence. This work adds new information on functional role for META1 in secretory processes in Leishmania. Additionally, it identifies a domain within META1 that may be critical for its functions. META1 has long been associated with virulence but its activity and the processes it influences to modulate virulence have remained unknown. In order to identify the function of this enigmatic yet essential protein, we have used an evolutionary biology approach to first identify the origins of META1. Having provided several lines of evidence that META1 arose in Leishmania as the result of a LGT event of hslJ from bacteria, we leveraged this information to get clues about META1 function by comparing it to its bacterial homologs. We utilized 3D-modeling to show that META1 shares a structural scaffold with HslJ and MxiM. The striking structural similarity between these proteins despite a limited sequence homology points to evolutionary constraint on retaining structural folds in proteins and the retention of related functions. The sequence divergence most likely allows for specificity of interacting molecules. The conserved scaffold between META1/HslJ/MxiM identified a shared cavity in these proteins. We have extended the known involvement of MxiM in secretion and the possibility of a role for such a cavity with regards to META1 function. Using molecular biology approaches, we demonstrate that ectopic expression of META1 and site-directed mutagenesis of selected residues in the predicted META1 cavity do affect secretory processes in Leishmania, thus establishing a function for this poorly characterized protein as well as identifying a functional domain within the molecule. Overall, our study demonstrates the utility of a multidisciplinary approach that combines insights from evolutionary origins of a molecule with bioinformatics analyses and computational approaches, leading to a predicted structure and activity, both of which are testable at a molecular level. BLASTP and PSI-BLAST searches  were performed against the NRDB using the NCBI server http://www.ncbi.nlm.nih.gov/BLAST. Pfam search  was performed using HMMer via the Pfam server at http://pfam.sanger.ac.uk/. All the sequences (DNA/protein) used in the study for codon bias, phylogenetic analysis and synonymous & non-synonymous rate estimation were obtained from NCBI. For E. coli HslJ, sequence information was used from accession number NP_4158971.1. Sequence alignment was done with CLUSTALW available at http://www.ebi.ac.uk/clustalw/ or EMBOSS http://www.ebi.ac.uk/Tools/emboss/align/index.html. Sequence to structure alignment was done with PROMALS3D software available at http://prodata.swmed.edu/promals3d/promals3d.php. Total GC content and GC content at codon positions for all L. major ORFs and META1 was obtained using Integrated Genomic Island Prediction Tool (IGIPT) software available at http://ccnsb.iiit.ac.in/nita/IGIPT/srk/index.php. FASTA files for all L. major ORFs was obtained from the Wellcome Trust Sanger Institute at ftp://ftp.sanger.ac.uk/pub/databases/L.major_sequences/. For calculating Codon Adaptation Index (CAI), the Relative Synonymous Codon Usage (RSCU) values of the highly expressed genes of L. major were obtained from . CAI values of reference genes from Additional file 2 and META1 were calculated manually as described earlier . The sequences were aligned using MUSCLE  on default settings. Gaps were removed from the alignment manually. Phylogenetic tree was generated by PhyML  using the evolutionary model WAG, the gamma-distribution model, four rate categories and invariant position. The WAG model was found to be the best-fitting model using PROTTEST . The gamma parameter and the fraction of invariant positions were estimated from the data. The trees were optimized for topology, branch length and rate parameters. Each tree was subjected to 100 bootstrap replicates. iTOL  was used for viewing the phylogenetic tree and later on modified in Adobe Photoshop CS4 for publication. Re-rooting of the tree was also done using iTOL. The accession numbers of the protein sequences used are given in Additional file 11. Synonymous (Ks) and non-synonymous (Ka) substitution rates were estimated using the methods as described earlier  as implemented in yn00 in the PAML software . Consensus structure prediction for META1 was performed using 3D-Jury http://bioinfo.pl/meta; ). MODELLER 9v2  software was used to obtain the final model of META1 based on the NMR structure of an E. coli HslJ (PDB code 2kts). The model was viewed using the program O  and was compared with that of the template and related structures. The program O was also used for superposition of META1 and HslJ structures on that of S. flexneri secretin pilot protein, MxiM (PDB code 1y9t) for comparison. The figures were made using PyMol . L. donovani MHOM/IN/1983/AG83 and L. major MHOM/Su73/5ASKH were used for all the experiments. The conditions for promastigotes Leishmania cultures are as described earlier . For all experiments, cell numbers were estimated by direct counting in a hemocytometer under a light microscope. The promastigotes were routinely inoculated at a starting density of 106cells/ml; typically, logarithmic growth was observed between day 2-4 and stationary phase between day 5 and 7. Hence, in all experiments, 3 days and 7 days old cultures were used as representative of log phase and stationary phase respectively. For axenic amastigotes, log phase promastigotes were pelleted down by centrifugation at 3000 rpm for 10 min, washed with PBS and resuspended in amastigote media (Complete HOMEM, 20% FCS, pH 5.5) and incubated at 37°C with 5% CO2 for 48 hrs. Promastigotes convert into amastigotes within 48 hrs. For generating attenuated parasite line, virulent promastigotes were passaged in HOMEM medium once a week until 30 passages and thereafter, infectivity of the parasites were checked in BALB/c mice after 4 weeks of inoculation. Total RNA was isolated using the acid guanidinium isothiocyanate method . 1 μg of total RNA from L. donovani was treated with DNAse I (Ambion Inc.). Synthesis of cDNA was performed by using First Strand Synthesis kit and the Superscript III Reverse Transcriptase (Invitrogen), according to the manufacturer's instructions. All real-time PCR experiments were performed in ABI prism 7900 HT sequence detection system (ABI) as described earlier . The PCR conditions were as follows: 95°C for 10 min, 95°C for 15 sec, 58°C for 30 sec and 72°C for 30 sec for 40 cycles. Following primers were used in QRT-PCR analysis; for LdMETA1: TV359 & TV360, for LmjMETA1: TV672 & TV758, for neomycin: TV 397 & TV398, for GFP: TV276 & TV396 and for GAPDH: TV366 & TV367. Sequences of all the primers are mentioned in Additional file 12. All the reactions were analyzed using the software (SDS 2.3) provided with the instrument. The relative expression of the genes was calculated by using 2-ΔΔCt formula using GAPDH as a normalizer. The values reported are the mean of at least three biological replicates. The standard deviation from the mean is shown as error bars in each group. The LdMETA1 coding region was PCR amplified from L. donovani genomic DNA, using primers TV213 & TV215 and cloned in EcoRI-HindIII site of pET28a+ vector (Novagen). Primer sequences are listed in Additional file 12. The recombinant constructs were transformed in E. coli BL21 (DE3) strain and protein expression was induced at A600 of 0.6 with 1 mM of isopropyl-1-β-D-galactopyranoside at 37 °C for 3 hours. Recombinant 6X-His-META1 protein was purified from bacterial cells in native conditions using the Ni2+-nitrilo triacetic acid agarose resin (Qiagen), according to the manufacturer's instructions. For raising polyclonal antibodies against recombinant 6X-His-META1 protein in the mouse, 50 μg/animal of protein was mixed with an equal volume of Freund's complete adjuvant. The mixture was made into an emulsion by passing through a 2 ml syringe (1.5 inch 19G needle) and intermittently keeping it at 4°C. This emulsion was injected into the mouse subcutaneously. After 14 days, the first booster dose was given in a similar manner, except that Freund's complete adjuvant was replaced with Freund's incomplete adjuvant. Subsequent booster doses were given after a 14-day interval and the antibody titer was checked using dot blot. For determination of antibody titer 20 ng of purified protein was spotted in a row, air-dried and incubated with different concentrations of immune serum (1:1,000 to 1:5,000). Western blot experiments were carried out when the appropriate titer (1:5,000) was obtained following booster doses. Mice were sacrificed and blood collected from the inferior vena cava using a 23G needle and a 2 ml syringe. The blood was allowed to stand at room temperature for a couple of hours and then kept at 4°C for overnight to allow formation of a firm clot. Red blood cells were removed by centrifugation, the sera were collected in a fresh tube, 0.2% NaN3 was added and stored at 4°C. All experiments involving animals were performed in compliance with recommendations and permission of the CCMB Institutional Animal Ethics Committee. The META1 gene of both L. donovani and L. major were cloned in frame with GFP at the C-terminus and further this META1-GFP cassette was ligated into BamHI-XbaI site of pX63-NEO vector. The L. donovani and L. major META1 genes were amplified from genomic DNA by using the primer combinations TV494 & TV757 and TV494 & TV758 respectively and GFP was amplified using TV276 & TV277 from pX63-EGFP vector. PCR amplicons of META1 gene of both L. donovani & L. major and GFP were first cloned using pMOS blunt end cloning vector kit (GE Healthcare) as per manufacturer's instructions. Inserts were released from pMOS by using restriction enzymes inserted in the primer sequences. Extra sequences were added in the primers to maintain the reading frame and/or to add restriction sites for cloning: for META1, TV494 with a BamHI and TV757 & TV758 with NcoI site respectively and for GFP, TV276 & TV277 with an NcoI and XbaI site respectively. Primer sequences are listed in Additional file 12. Leishmania promastigotes were grown to late log phase (~2 × 107cells/ml). Transfection protocol is the same as described earlier . Briefly, cells were washed and resuspended in ice cold electroporation buffer (137 mM NaCl, 5 mM KCl, 0.7 mM Na2HPO4, 6 mM glucose, 21 mM HEPES pH 7.5) at a density of 108 cells/ml. 400 μl of cells and 100 μg of plasmid DNA were mixed well into 0.2 mm cuvettes (Biorad) then electroporated in Genepulser II apparatus (Bio-Rad Laboratories) with the pulse of 450 volts (2.25 V/cm) and capacitance 500 μF. Cuvettes were immediately placed on ice for 10 minutes. Cells were transferred to 5 ml of complete HOMEM media. After 48 hours, transformants were selected in HOMEM containing G418 until the control, untransfected cells died completely in the presence of the antibiotic. Concentrations of G418 used were: 40 μg/ml for virulent L. donovani & L. major promastigotes and 200 μg/ml for attenuated L. donovani promastigotes. For further experiments, pool populations were maintained in liquid media containing G418 in above mentioned concentrations for the respective cell types. For generating constructs with point mutations in META1, site-directed mutagenesis (SDM) was carried out using QuickChange-XL kit from Stratagene as per manufacturer's instructions. pX63-LdMETA1::GFP (Ld/Ld-WT) and pX63-LmjMETA1::GFP (Lmj/Lmj-WT) were used as templates for SDM of L. donovani and L. major META1 mutagenesis. Details of the primers used are given in Additional file 12. Leishmania promastigotes or amastigotes at different stages of growth were harvested, washed in PBS and then resuspended in 1X-PBS with 1X-protease inhibitor cocktail (Roche) and then sonicated using VibraCell (Sonics & Materials Inc.) with 50% amplitude and three pulses for 30 sec each. 30 μg of protein lysate from each sample were separated on 15% SDS-PAGE and transferred onto nitrocellulose Hybond ECL membranes (Amersham Biosciences). Membranes were blocked with 5% non-fat dried milk in 1X-TBS-T (10 mM Tris-HCl, pH 8.0, 150 mM NaCl, 0.1% Tween-20). The following antibodies were used: mouse anti-LdMETA1 (1:5,000) was raised against recombinant N-terminally 6X-His tagged LdMETA1 protein, rabbit polyclonal BiP antisera (1:15,000), rabbit polyclonal GFP antibody (Abcam; 1:4000), sheep polyclonal GP63 antisera (1:10,000), anti-mouse or anti rabbit biotinylated antibodies (1:5,000, Amersham), avidin conjugated with horseradish peroxidase (1:10,000, Amersham Biosciences) and anti-sheep conjugated with horseradish peroxidase (1:5,000, Santa Cruz Biotechnology). After incubation, membranes were washed three times with 1X-TBS-T. Immunodetection was carried out using the ECL western blotting detection system (GE Healthcare) according to the manufacturer's instructions and images were obtained using BIOMAX™-XBT X-ray film (Kodak). Images of western blots were quantified by ImageJ software available at http://rsbweb.nih.gov/ij/. For western blots on the culture supernatants, media from cultures were passed through a 0.22 μm membrane and concentrated 50-fold using Millipore Amicon 5 kDa cut-off and loaded onto SDS-PAGE gel along with whole cell lysates as control. SAP activity was determined in culture supernatants as previously described . After seeding cells at a density of 106cells/ml, aliquots of culture medium were removed at log and stationary phase, filtered through 0.22 μm pores membrane to remove cells and debris. 138 μl supernatant was then incubated in a final volume of 200 μl with 50 mM para-nitrophenyl phosphate (pNPP), 50 mM sodium acetate pH 4 and 0.1% β-mercaptoethanol (v/v) for 30 minutes at 37 °C. The reaction was stopped with 800 μl of 2M sodium hydroxide and the absorbance of the released para-nitrophenol was determined at 410 nm. For intracellular SAP activity, cell pellets were washed with PBS and were lysed on ice for 30 min at 108 cells/ml in 50 mM acetate buffer and 1% Triton X-100. 100 μl of lysate was then used for SAP assay with 50 mM pNPP. We thank members of the Vaidya lab for useful discussions and suggestions. We thank Dr Steven M. Beverley for the pX63 plasmids, Dr Mary E. Wilson for GP63 antibody and Dr Jay Bangs for BiP antibody. We are grateful to Dr Nita Parekh and Ms Ruchi Jain from IIIT, Hyderabad, India for helping us with IGIPT software. We are thankful to Dr Harpreet K. Saini from EMBL-EBI for technical support and valuable suggestions. We thank Mr Aridaman Pandit from CCMB, India for helping us with phylogenetic tree construction. VP and AG were supported by senior research fellowships from CSIR, Government of India. VP was a recipient of 2007 Sanger Institute Prize and is grateful to the Wellcome Trust Sanger Centre Prize Fund (Grant number 079643/Z/06/Z) for financial support provided for research carried out at the Sanger Centre in AJE's lab and for supporting the cost of publication. This research was supported by the CSIR, Government of India to TV. Funding agencies have no role in study design, data collection, analysis and writing of the manuscript. VP participated in design of the study, carried out bioinformatics analysis, laboratory experiments, analyzed the data and drafted the manuscript. AG and RS constructed the homology model and analyzed the structures. AJE helped design the analysis of evolutionary origin of META1, participated in data analysis and critically read the manuscript. TV participated in design of the study, supervised the work, analyzed the data and drafted the manuscript. All authors read and approved the final manuscript.